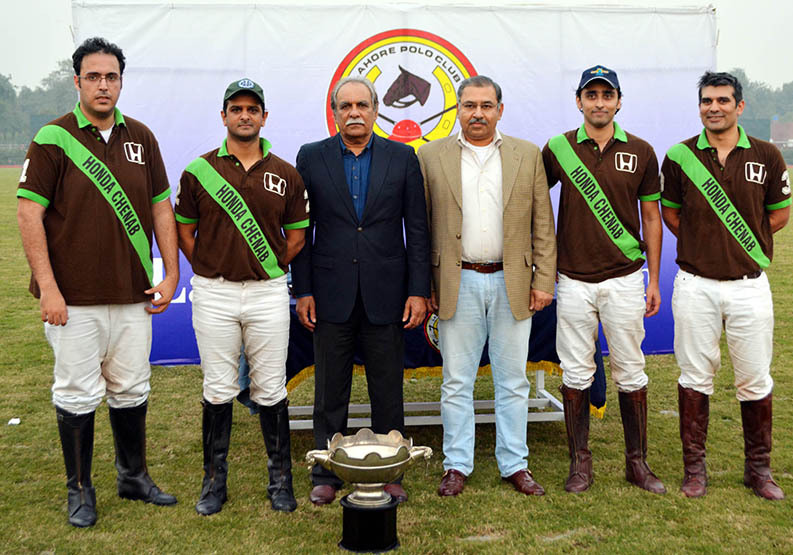 LPC LAHORE: Bilal Haye burst eight goals to guide Honda Chenab to a convincing 12-10 victory over Artema Medical/Black Horse Paints and clinch the Winter Polo Cup here at the Lahore Polo Club (LPC) ground on Sunday. The main final proved to be a high-voltage encounter where both the teams displayed quality polo skills and techniques and in the end, Honda Chenab emerged as title winners after edging past by 12-10. The final started with both the teams attacking each other goals and it were Honda Chenab who dominated the first chukker by taking 4-1 lead. The second chukker was though evenly poised as three goals each were scored by both the sides but Honda Chenab were still enjoying 7-4 lead. The third chukker was once again dominated by Honda Chenab who fired fabulous four goals and Artema Medical could score one as the chukker ended with Honda Chenab enjoying 11-5 lead. Hamza Mawaz Khan changed the game plan and started playing aggressive polo, which paid dividend and he succeeded in hammering a hat-trick to reduce the deficit to 11-8. But in the dying moments, one more goal was converted successfully from Honda Chenab to enhance their lead to 11-8. With two goals handicap advantage for Artema Medical, the final score was 12-8 in favour of Honda Chenab. Bilal Haye has been tremendous with his pony and mallot throughout this polo season and this event too, he kept on firing fantastic goals for his team and in the final, he emerged as top scorer by smashing exceptional eight goals. Ahmed Ali Tiwana and Ghulam Mustafa Monnoo banged in a brace each. From the losing side, Hamza Mawaz Khan hammered double hat-trick while Abubakar Siddique and Ahmad Bilal Riaz scored one goal apiece. Dawood Group outclassed Newage by 10-3 to win the subsidiary final. From the winning side, Raja Arslan Najeeb struck five goals, Abdullah Dawood three and Omar Asjad Malhi and Mumtaz Abbas Niazi hit one goal apiece. From the losing side, Alman Jalil Azam scored a brace while Shah Shamyl Alam added one.